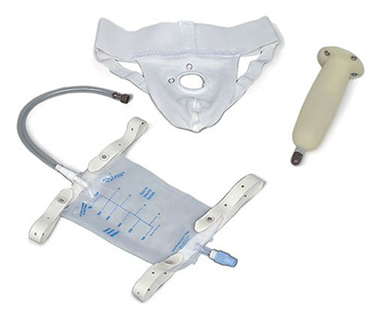 Reusable, discreet male incontinence solution. The McGuire Style Male Urinal is a great choice for men who suffer from incontinence or even those who just need to extend the time between restroom stops, such as long drives, flying or other times when access to a restroom is not available. The Uni-Size adjustable version has three different positions, each covering a range of sizes from waists 26" to 44." Replacement sheaths are available as well. The McGuire can be used as a self-contained unit for small amount of urine output (150 cc) or can be used in conjunction with a leg bag to expand the collection resources up to 1000 cc. The McGuire is easy to put on and is virtually unnoticeable under your clothing. The anti-reflux dam keeps your skin dry. The soft fabric waistband makes the device comfortable and secure. You may be able to go for many hours without having to empty your leg bag. To use with a leg bag, connector tubing must be used. Machine washable. Discreetly delivered to your home. Medicare Billing Code A5105.